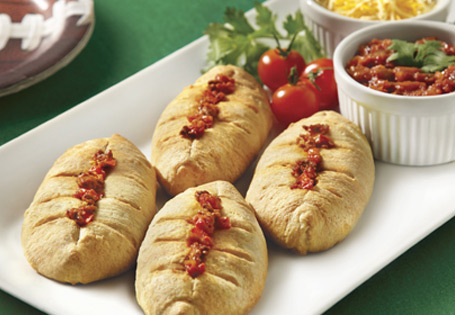 Mini football-shaped calzones bursting with chili and cheese. In a sauté pan over high heat, sauté the bacon, onion and bell pepper until bacon is crisp. Drain oil and return mixture to pan. Add the chili, hot sauce and tomatoes. Bring to a simmer. In a small bowl, combine the corn starch and water. Stir into the chili mixture. Simmer for 3 minutes until thickened. Remove from heat, add 2 cups of cheese and refrigerate for 10 minutes. Calzone assembly: Roll out each crescent roll dough and pinch the seams together to form a rectangle. Cut each flattened dough into 8, a total of 32 squares. Fill half the squares with two heaping tablespoons of chili, sprinkle with cheese. Top with the second half of squares, pinch the seams together. Tuck two sides of the square under and pinch the opposite sides together to form football shapes. With a sharp knife, score the top of each football with a crisscross to form the seams. Bake for 8-10 minutes, until golden brown.